Guitar players today are absurdly lucky. Not only can you find great quality guitars cheaper than ever before, but you can find a wealth of resources on the web - both free and paid - to assist you with learning to play the guitar. The bad thing is there’s almost too much choice when it comes to selecting guitar lessons on the web. To add to the frustration, the quality varies so much. Anyone with a guitar, cheap webcam, and a YouTube account can throw up a lesson... but that doesn’t mean they’re qualified! We have several guitarists on the Equipboard team, and between us we’ve tried nearly every method there is to learn and improve our guitar skills. We combined our experience with scouring the web to find out what actual guitar lesson students are saying about their experiences - both good and bad. Basically we did many hours research so you don’t have to! Before you dive in, we’ve summarized our findings in the chart below. Now, you might be thinking, aren’t there more than four guitar lesson websites out there? There certainly are - in fact, there are dozens of websites, and even more if you count apps available on iPhone and Android. We signed up for all of them and took them for a test drive. Truth be told, some are total trash. Several are pretty decent, but in the end what we found is four websites emerged as the clear winners when it comes to online guitar lessons. If you only take one thing away from this article, it’s this: Guitar Tricks and JamPlay are the top two membership-based websites. They’ve both been around for a really long time, they’re good at what they do, and they have generous free trials to let you try them out. The best free option out there is without a doubt Justin Guitar, which has YouTube-based video lessons taught by Australian guitarist Justin Sandercoe. Not the best lesson site in the world, but the fact that it’s free & popular makes it a no-brainer to include. ArtistWorks is also worth a long look, and what’s cool about them is you can record yourself playing, and an instructor (sometimes a famous guitarist!) sends you back feedback. Use this chart to familiarize yourself with the lay of the land, and continue reading for our full reviews and pros and cons of each. Learning the guitar is a tricky beast. It’s all too common for guitar players to get stuck, hit plateaus, get comfortable or lose motivation. From personal experience, the best way to improve is to seek out a structured, planned resource of online guitar lessons. Novice guitarists have a tendency to seek out the free resources first. And while there are a wealth of free lessons on YouTube, they lack structure. If you spend time reading forums, often beginner guitarists wished they had shelled out the $20 per month for a structured, step-by-step program taught by reputable instructors. Why learn guitar online? To put it into perspective, a one hour lesson with a guitar teacher is anywhere from $20-50. For around $19/month for online lessons, you get unlimited access to their entire catalogue of material. Not only that, but you can do the lessons from the comfort of your own home - no need to drive anywhere! Also, not sure about you, but when we get in the zone we want the freedom to practice for over the 30 or 60 minute limit of an in-person lesson. Online guitar lessons will fit much more comfortably in your busy schedule. Beginners often ask if they should start out learning on an acoustic or electric guitar. The answer is both “it depends”, and “it doesn’t really matter!” Simply take a look at this list of famous guitarists and their first guitars - there’s not really much of a pattern, with all of them learning on something slightly different. One school of thought argues that learning on acoustic guitar is better because it’s harder - pressing down on the strings takes more strength, barre chords are more difficult, and there is no amp/effect/distortion to cover for your mistakes or sloppy playing (Gibson puts it rather well in the image below). They also argue that moving from acoustic to electric is easier than the reverse. Truth be told, countless musicians started on electric guitar and went on to be amazing players. Because learning how to play an instrument is a labor of love, it very much comes down to what you connect with the most. If all the players you look up to play electric guitar, and that’s the type of music you want to play, then by all means, go electric! Without further ado, check out our reviews of the 4 best online resources to learn guitar! Make no mistake - Guitar Tricks contains some of the best and most organized online guitar lessons you’ll find. Much of the praise about other online guitar lesson sites can be applied to Guitar Tricks - after all, they are all in such heated competition that they tend to keep up with each other feature-for-feature. One thing that stands out about Guitar Tricks is what they call their Core Learning System, which is a structure that guides you through the fundamentals on to more intermediate concepts. If you’re just starting out, using this system you’ll be well on your way to playing chords and basic solos. Another thing we like is how transparent they are about their Free Trial. Want to try before you buy? All you do is go here, fill in your email address, and you can dive into some lessons! Be aware that they are quite persistent with sending you emails urging you to sign up, which is understandable since the more paid memberships they get, the more they’re able to keep delivering such a high quality service. Guitar Tricks is our winner when it comes to the best way for beginners to learn. The Core Learning System is outstanding, and the monthly membership price is a steal considering the amount of content and guitar instruction you get. Justin Sandercoe - better known as Justin Guitar - has gathered quite the following in the world of online guitar lessons. He hosts two different YouTube channels: JustinSandercoe (boasting over half a million subscribers) is the main lessons channel focusing on theory and technique. JustinSandercoeSongs is - you guessed it - centered around teaching you how to play songs. If you read our Free vs Paid Lessons section, you know our thoughts around free lessons lacking the structure and depth that the paid courses provide. Even though JustinGuitar uses YouTube to host all of his lessons, he actually tries to combat this by organizing all his videos on his website. He does a reasonably good job with categorization. For example, are you a total beginner? Head to his Beginner’s Course section. Want to focus on technique? There’s a section for that also. It’s worth mentioning that his website is mobile-friendly, and he has 4 mini-apps available in the Apple App Store, one of which is free (the others are $1.99). So, are the lessons good? In a word, yes... and being free makes them even better. Justin really seems like he enjoys his craft, and his genuineness comes through in his video lessons. There’s a good feeling to always seeing his friendly face as you go through video after video. He keeps his lessons short and easily digestible. We definitely recommend Justin Guitar, especially because it’s free; it’ll only cost you time (there are a few advertisements here and there on the site, but nothing excessive). But because your time is precious, here’s what we recommend: If you’re a beginner, jump on the Beginner’s Course and see how you like it. Stick with it for a few days, and figure out if the loose structure & organization works with your style of learning. Even if you end up opting for paid lessons, know that you can always come back to JustinGuitar anytime since it’s completely free and everything is on YouTube. JamPlay is one of the “Big Two” online guitar lesson services (the other being Guitar Tricks). It features a whopping 5,000 guitar lessons, making it one of the most comprehensive guitar instruction services on the web. From heavy metal to country, if you want to learn it you’ll find it here. When reading various users’ reviews on JamPlay we found it generally comes widely recommended. Positive reviews far outweigh the negatives, with most of those being, “well, it’s not free.” Considering how high quality the polish and presentation of JamPlay is, and the sheer quantity of lessons, we feel that $13/month is extremely reasonable (a year membership is $160, which divided by 12 months comes to about $13)! Jumping into the world of JamPlay just feels nice. You want to learn it? Chances are they have lessons for it. Fingerstyle, classic rock, country, metal… they have it all. We’re enjoying our experience with JamPlay because it has managed to improve our playing no matter our current skill level. The folks on our team who had never picked up a guitar before really like the video lessons geared to beginners, and the advanced super-shredders can find lessons and exercises to make them even better. One of our teammates used JamPlay to get started learning to play guitar online. Some time later they enrolled in lessons with a teacher to compare the experience, and the teacher told him had very good form for a beginner. Do we recommend JamPlay? If you’re a beginner who might thrive better with a single focused beginner’s course, you might be better off taking a look at Guitar Tricks. Other than that, let’s see: 1000s of guitar lessons covering 100s of genres and styles, free trial, 100% money-back guarantee if you don’t love it, $13-19 per month … what more could you want? We think it’s a no brainer. What we love about ArtistWorks is the ability to sign up for a la carte specific lessons from a specific instructor based on types of guitar (acoustic, electric, dobro, etc) and specific to the style you want to learn (Rock, Blues, Country, Jazz, Classical, etc). This is different from most sites, that sell access to a broad library with different teachers. If you’re the type that learns best from in-person one-on-one private instruction, ArtistWorks is the most like that of the online guitar lessons we’ve tested. Why, you ask? Well, for around a dollar a day, you are able to get direct video feedback from legends. Okay so here’s how it works: You record videos and send them to your teacher and they give you direct feedback via video messages (you can rewatch those as many times as you need, which is a big selling point for us). But these are not random teachers. You know Paul Gilbert? The one always in Guitar World and from the band Mr. Big. We tried out his Rock Guitar course first. More than being an obviously supremely gifted guitarist, he proves himself to be a great teacher as well. At first we were skeptical (we say that because we’ve all seen some celebs endorse things to make money and then phone it in). Mr. Gilbert totally over-delivered. He comes off as passionate, competent, and a great instructor in the videos. And, we have to say, the other instructors on ArtistWorks are also legends in their own right. The fact that these lessons are taught and you can receive feedback directly from people like Keith Wyatt, Guthrie Trapp, and Chuck Loeb, to name a few, make this feel like an authentic place to get great quality lessons rather than a cheap licensing deal just trying to cash in on name recognition. Relevant PDFs also accompany the lessons, so you’ll be able to download the chords and relevant materials to make following along with the lessons a breeze. The competency of the instructors is amazing. After all, where else can you learn from the likes of these guitar gods? ArtistWorks’ use of slow motion video is really helpful in making sure the video lessons are absorbed, especially for beginners and to catch subtleties. The community aspect of the site is better than others. This means not only interacting with your teacher, but also fellow students, which adds to a fun learning environment and can up your game. You are able to view other videos submitted by users on the Video Exchange tab on the specific lesson’s page, and often times your peers will add value to the lesson in a different way than the teacher. The skill level for each lesson (fundamental, intermediate, advanced, etc) is spelled out in the course menu, so you can make sure you are comfortable with what you’ve learned before moving on to more difficult lessons. We encountered a few confusing parts on the website with regards of how to use features for the first time, but eventually got the hang of it with some playing around and experimenting with the interface. The videos are not available for download and can only be streamed, which is a bummer if you’re on the go and want to take your lessons somewhere without a reliable internet connection. Finally, the library is a bit limited. Most styles/genres are covered, but if you’re looking for something super specific ArtistWorks might not have it. It’s hard to complain about getting personalized instruction and feedback from famous guitarists and getting access to an active community in addition to hundreds of video lessons at this price point. While we do wish ArtistWorks offered a free trial similar to GuitarTricks or Jamplay, if you see the style of play you are interested in, it’s hard to beat the quality of this content. 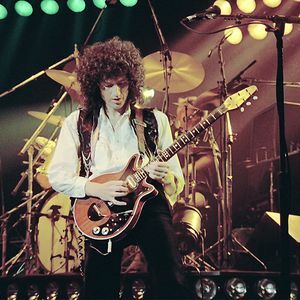 A heartwarming story, Brian May actually built his first electric guitar (which he would go on to use with Queen) with his dad. It was intentionally designed to allow feedback after May was inspired by the playing of Jeff Beck. He also received a Spanish style acoustic guitar as a birthday present, though he quickly wanted to move on to an instrument more suited towards the type of music he wanted to play. First Guitar: Spanish-style guitar of unknown origin. How He Learned: Self taught, though he did take formal music lessons in his youth. How is justinguitar.com not on this list? helbnt We've been getting some great feedback on this list, so we're actually in the process of revising it (and adding some pretty cool bonus content ;-) ). Thanks for the suggestion and YES JustinGuitar is definitely going to be included in our revised list. Artistworks is the best. Rock Guitar school with Paul Gilbert 20/mo with video exchanges with paul himself. How about ultimate-guitar - Tab pro? I signed up for JamPlay after I saw it here and while it says they have beginner to advanced lessons I would say it basically all beginner to medium, but it is a great site for those starting or for those who don't know too much music theory or playing in other genres. If you know enough that you could probably teach guitar than this site isn't for you. Another great website, that somehow not a lot of people know about, is www dot utab dot com the best thing about it, is that you can link every youtube you want to play, to the search bar, and it syncs and gives you all the chords and lyrics along with the original video. love it! My favorite free guitar lessons set is AndyGuitar dot co dot uk Something about this guy just seems comfortable and directly to the point. I was not impressed with Justin. I think I felt he was too random in many of his comments. Andy Crowley is like the next door teenager who is super jazzed about guitar and is happy to share with you so you can become as good as he is, except he is actually a well accomplished musician and teacher. He is definitely geared toward the beginner guitarist -> intermediate guitarist. Very pleasant to learn with. I would love to hear your review. For years and years I'd followed Andrew Wasson on his Creative Guitar Studio YouTube channel. Andrew is a G.I.T. graduate, very competent at explaining guitar concepts & guitar /music theory, (plus he's a masterful guitarist). I feel that he's one of (if not the), best guitar teachers online. In summer 2016, I joined his membership website and have been studying his online courses, (Intermediate & Advanced). He also does Skype too. If you want a solid guitar course with a lot of intermediate and advanced content, (based /taught on the premise of the actual G.I.T. curriculum - from a real graduate), then Andrew's THE guy - above anyone else I've ever seen. Watch him on YouTube for awhile like I did, and you'll see what I mean. Nate Savages Guitarlessons.com and Truefire.com are also great sites to learn from. They both have great reputations in the online guitar community. Guitartricks is great for beginners too. Pretty short list, I think there are more good sites. The ones I used most are theguitarlesson dot com (as a beginner) and guitartricks dot com (later to learn blues), the prior isn't even on your list :-D Someone mentioned Andrew Wasson, I think he's a bit boring. Andyguitar is ok as a very beginner, but I just didn't click with the guy. You have a nice tight list of very affordable guitar courses here. Kudos. Just ... how is the Music Institute Online online[dot]mi[dot]edu not on this list? They have Scott Henderson and Oz Noy, each teaching separate courses that totally rock! I mean OK, they are not the cheapo type courses you have up on this page. But the course quality of each is simply terrific. A friend of mine took the Oz Noy course and in very little time, she was able to do a crazy Dueling Guitar thing with me. It definitely improved her skills. So is this the same post from previous years, just relabeled as 2018? Just curious. Hey eric_andrew_dodson! Thanks for the question. We revisit this article periodically to make sure its advice is still accurate and relevant. Since it was originally published, we’ve adjusted price points, coupon codes, free trial availability, and even swapped out guitar lesson websites when we feel better ones come along. A couple of our team members actively use Guitar Tricks and Justin Guitar and continue to love both, so those remain the ones to beat. It's really great list, no doubt. To me, particularly, I get use two websites that helps me a lot and have excellent resources besides videos. E-Chords and Guitar Camera guitarcamera dot com. Truefire must be in this list.